1) All matter attempts to move to its lowest-energy state. 2) All stampings will take whatever shape is possible to reduce residual stresses. 3) Achieving an energy state (part configuration) higher than the lowest state requires the addition of external energy to the system. 4) Nothing comes free—Mother Nature exacts a price for extra benefits. Fig. 1—When released from the die, the lower cup half experiences some expansion and a small reduction in compressive stresses. The upper half expands and changes from a compressive to a tensile stress until it balances the lower-half compressive stress. For a demonstration of these laws and stresses, consider a deep-drawn cup (Fig. 1). During forming, the blank compresses in the circumferential direction as it moves toward the die radius. 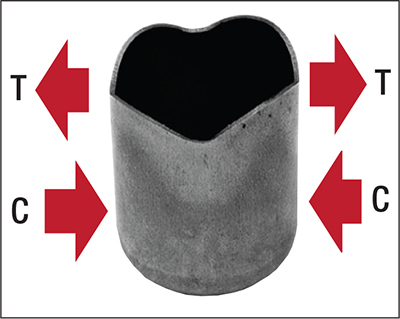 With the formed cup still in the die, its entire wall remains under compressive stress. Then, as the cup is removed from the die, the compressive stresses in the top half release and cup diameter increases. Plastic strain in the cup walls limits the amount of movement, and also restricts the opening of the cup diameter in the bottom half of the wall. As shown in Fig. 1, the cup continues to expand until all compressive stresses in the top half reach zero and are replaced by tensile stresses. The upper tensile stresses and lower-half compressive stresses must reach a balance. Unbalanced residual stresses place the object in motion. The earring in the cup results from anisotropy —directionality of the microstructure relative to the 0-, 45- and 90-deg. orientations in the sheetmetal coil. To prove-out these stress patterns, cups were formed from brass blanks. After removal from the die, the cup was filled with liquid to cause vertical grain-boundary cracks due to residual stresses. As the cracks formed, the vertical strips bent outward like a bunch of flowers. To prove that this curling-out resulted from residual stresses, another batch of cups was stress-annealed after being removed from the die. After adding the same liquid, the cracks again formed but did not move out of position. Fig. 2—As the corner attempts to unbend, the outer-wall tensile stresses and the inner-wall compressive stresses work jointly to push the wall outward (sidewall curl). • Dropping the part on the floor. Fig. 3—The uniform tensile stretch of the wall adds a small tensile strain to the outer wall and a major tensile strain to the inner wall. The inner and outer walls now have about the same tensile strain, minimizing sidewall curl. As an opposite example, consider bending a part over a radius—this causes compressive and tensile stresses to join forces to create a large, unwanted sidewall curl (Fig. 2). 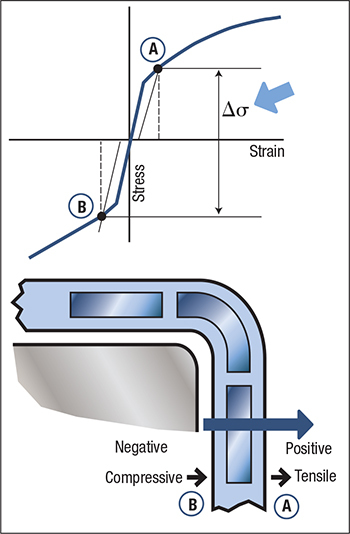 The outer fibers face positive (tensile) stress from the radius bend, attempting to pull the outer wall of the sheet outward to relieve the stresses. At the same time, the inside fibers are in compression from the radius bend and attempt to push the inner wall outward. The stress-strain curve shows the A side with highly positive stresses and the B side with highly negative stresses. 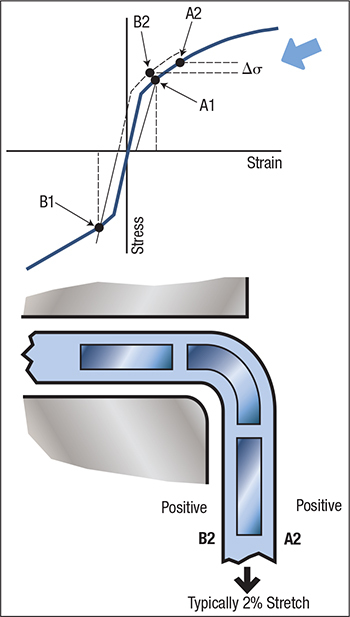 Note the very large stress differential between the tensile and compressive stress states; this drives the tendency to create sidewall curl.